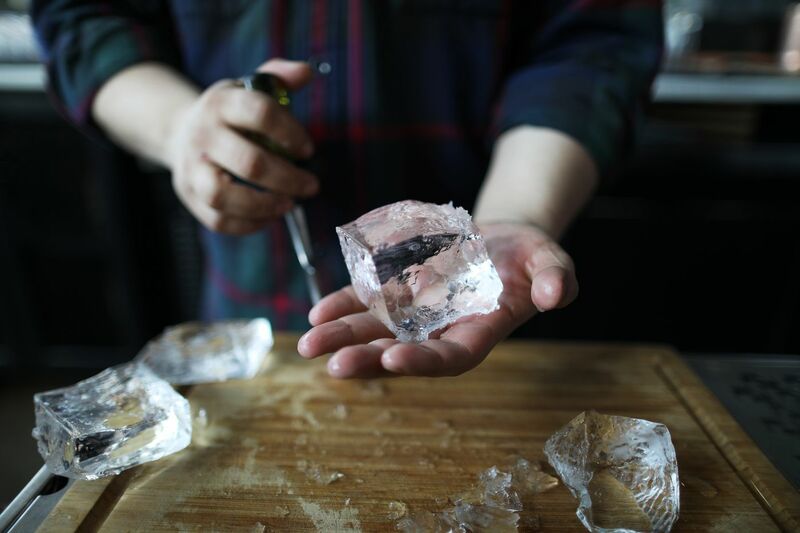 Bartender Canyon Shayer carves ice at Philadelphia Distilling. Ice can be the color of a cloudy sky or a glittering diamond. But crystal-clear cubes don’t just look prettier. They melt more slowly — and they even taste better. To bartenders and beverage managers at some Philadelphia cocktail bars, ice is one of the most important ingredients, a crucial tool for bringing a spirit, mixed drink, or mocktail to the right temperature. The thought of making a drink with cubes from a regular freezer tray is almost cringeworthy. “Well-made ice and ice that comes from, say, a hotel machine, is like the difference between cooking a meal using a cast-iron pan or a microwave," says Canyon Shayer, bar manager at Philadelphia Distilling, the Bluecoat gin headquarters and cocktail lounge just off Delaware Avenue. Clear ice melts more slowly than broken, cloudy ice. At R&D cocktail bar in Fishtown, the ice takes as much prep work as the syrups and other ingredients — maybe more, says part-owner Aaron Deary. That’s because all drinks are made with glasslike cubes that were molded and cracked by hand from large slabs into smaller pieces. Philadelphia Distilling head bartender Canyon Shayer carves ice for a gimlet cocktail. “It becomes this pristine piece of glass,” owner Frank Class said. “It’s pure, and there’s no taste to it." R&D Cocktail bar melts their letters into ice for their drinks. Many customers of the Chinatown cocktail bar Hop Sing Laundromat never see any of the hundred of pounds of ice the bar goes through each week, because most is used only for mixing drinks before straining them into glasses, owner Lê said. For drinks served with ice, the staff makes separate large and column-shaped cubes from filtered water, storing them in a freezer that holds only ice so as to preserve the taste. Lê, owner of the Hop Sing Laundromat cocktail bar, with some of his freshly made ice. Hop Sing’s Lê is an evangelist for clean ice; he said his staff is there after closing every Saturday night until almost dawn, cleaning the insides of his Hoshizaki ice maker with toothbrushes until it’s spotless, then running water through it. “A clean ice machine — it makes a huge difference,” Lê said. “It’s just common sense. Otherwise, you get the ice taking on a bad taste, a bad smell. " Lê's machine makes ice by pouring double-filtered water into a tray with a with metal mold, then freezing from the top, draining excess water from below. About half an hour later, a tray of fresh ice falls into the machine’s storage area in translucent one-inch cubes. Canyon Shayer carves ice at Philadelphia Distilling. Deary said shaking or stirring a drink with regular-size ice cubes can also give it a watered-down flavor. A drink stirred with the right ice, meanwhile, should taste silky and soft, no air in the liquid, just the ingredients. An Old Fashioned with one large cube next to an Old Fashioned with traditional ice cubes at R&D Cocktail bar.